We love science experiments! My 4 year old daughter and I collect rocks. She was so excited when I told her we can grow our own “Crystals” at home, with one household ingredient! It was a lot of fun, we are in love with the beautiful results, especially the rainbow! <3 We used the rainbow and shamrocks as St. Patricks Day decorations! They are so pretty! The rainbow was made made by laying the colors in order (red, orange, yellow, green, blue, purple) and twisting them so the red pipe cleaner on top is attached the highest, the orange second highest and so on. You just have to play with it to get the shape you want. Tie thread to two side of pipe cleaner designs. See Photos. 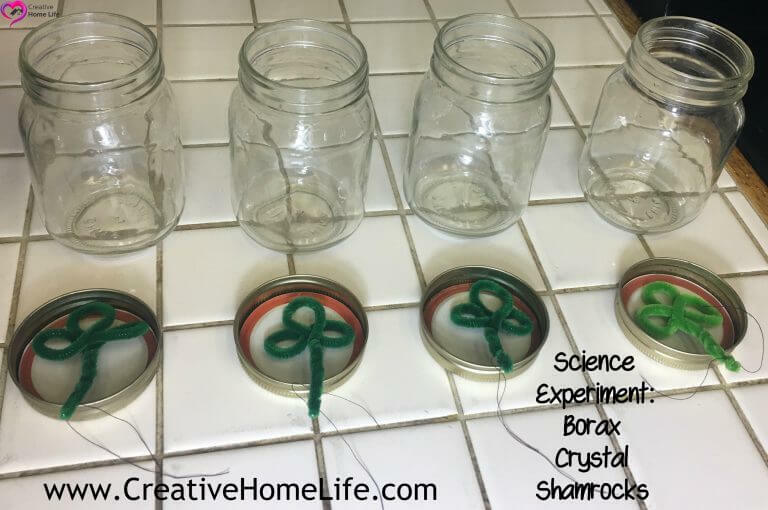 I don’t have exact measurements, with the water and borax . 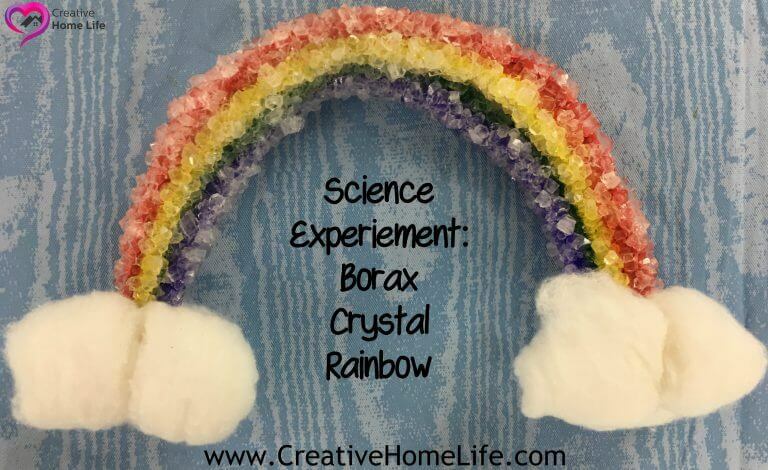 I read online a chemist said, the way to get the biggest crystals is to heat your water then carefully add in borax until it stops dissolving and don’t overdue it, because you don’t want cloudy water, I read it will produce cloudy crystals. 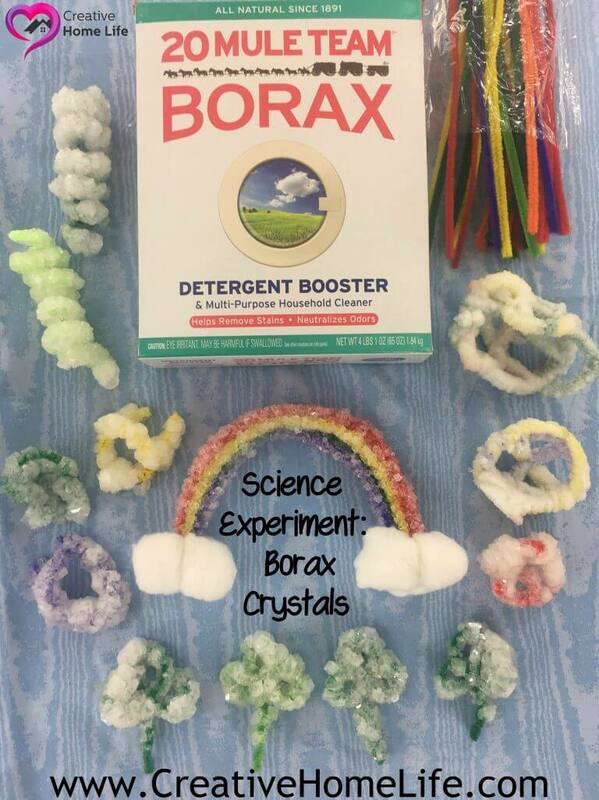 Please Note – Although Borax is a natural product it should not be inhaled or consumed. Be careful and follow the precautions on the box. As the water cools, the powder starts to solidify (turn from a liquid form into a solid form). We let our creations soak & crystallize for 24 hours. I meant to get photos of them crystallizing in the jars. Oops guys I forgot. When they were done, I removed them from the jars and placed them to dry on paper towels. Rainbow I added two cotton balls on the front and one attached to the back, with hot glue. A few of them I clipped the pipe cleaner parts that didn’t grow crystals, cause not all could be submerged entirely. 1. I read its best to put one pipe cleaner per jar, you will get bigger crystals. 2. 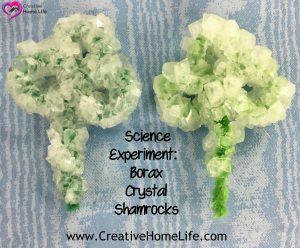 You can use the same borax & water solution, over and over again. Save in a large jar. 3. 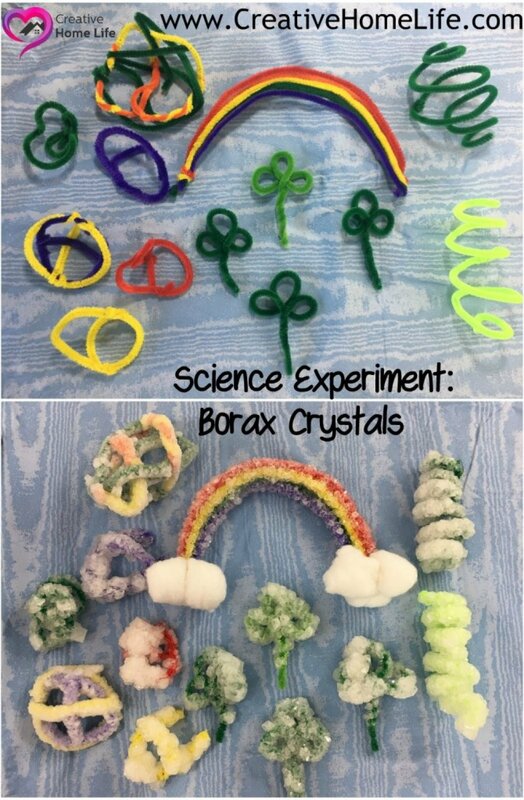 Try food coloring and white pipe cleaners. We used colored pipe cleaners, next time we are going to see what results we get with food coloring. If you do decide to try this science experiment, we would appreciate it, if you can share a picture on our Facebook page . 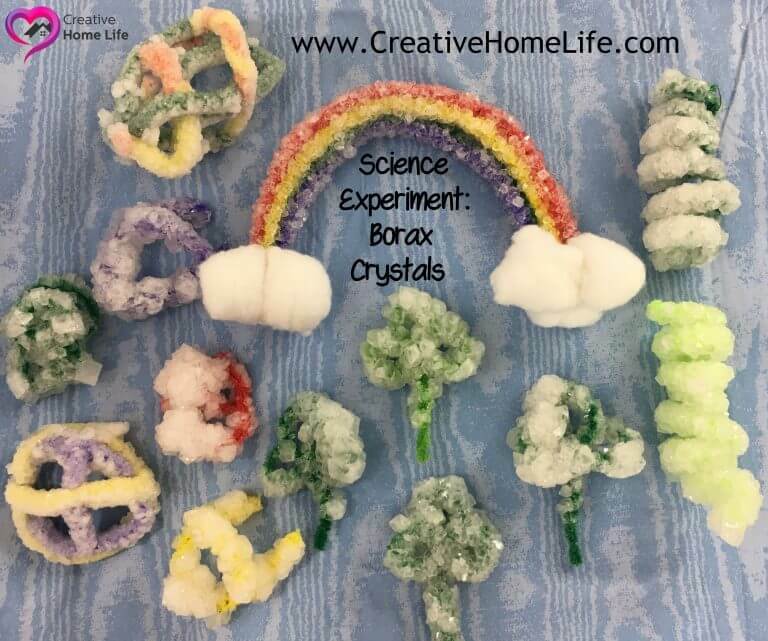 We would love to see how your borax crystals turn out! 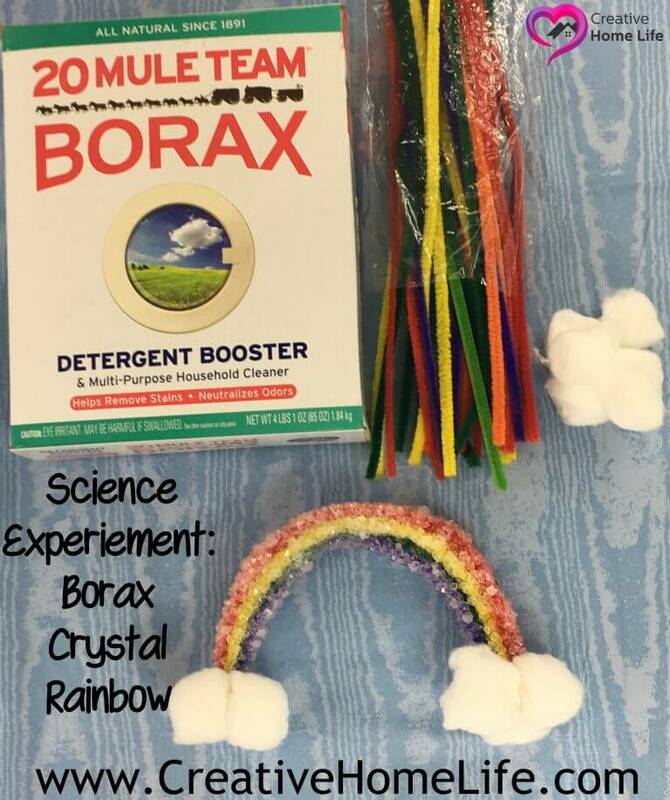 If you have any questions about our “How to Grow Borax Polymer Crystals” Science Experiment or anything else… Please feel free to message me or leave a comment. Thank you for reading! Previous PostHello first day of Spring! Fabulous Famous Quotes about Spring! Next PostEaster Egg Fillers the Ultimate Idea List! Over 133 ideas. Easter Basket Gift Ideas ~ The Ultimate List! Over 170 ideas.